West Liberty-Salem’s Gabby Hollar (4) drives the lane while Mechanicsburg’s Grace Forrest (11) moves to cut her off on Wednesday. 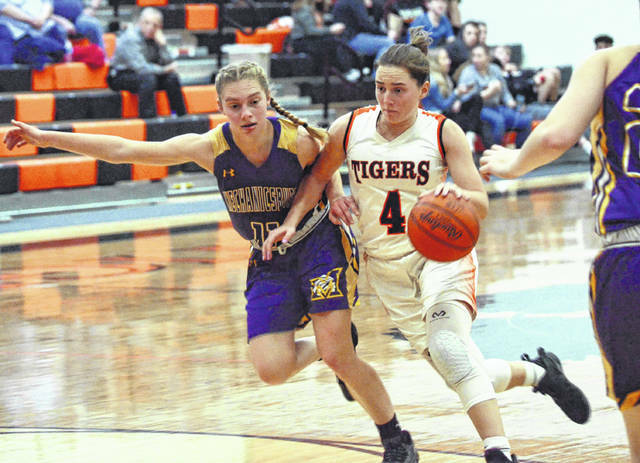 WEST LIBERTY – WL-S fought off a pesky Mechanicsburg team and beat the Indians, 46-30, in OHC girls basketball on Wednesday. It was exactly the kind of game that a contender like West Liberty-Salem – the 10th-ranked team in the state in Division III – wants as a tune-up before the tournament starts. Mechanicsburg (12-8, 10-5) looked like the better team early, pressing WL-S defensively and pushing the tempo. But the Indians fell behind, 13-5, on the scoreboard thanks to a trio of three-pointers from the Tigers in the first period. They finished with six bombs for the game. The visitors roared back in the second quarter, closing the gap to 23-19 at the intermission with a little more potent offensive showing. The Tigers opened it back up in the third, with their natural athleticism beginning to pay dividends against a tiring and foul-plagued Indians’ team. Morgan Hamby was forced to the bench with four fouls early in the third quarter and the Indians didn’t make a field goal until just before the buzzer sounded. Meanwhile, West Liberty-Salem (18-3, 15-0) heated up and finally found the bottom of the net a few times. “I thought we regrouped in the second half – especially in the third quarter. We got some stops and were able to hold them,” McIntosh said. Kelsey Day had 10 points, Grace Estes had 9, Gabby Hollar had 7 and Selena Weaver added 7 for WL-S. Grace Forrest finished with 16 points for the Indians. In the jayvee game, WL-S won, 38-25. Gabby Williams had 16 points for the Tigers. Mechanicsburg plays at Fairbanks on Friday while WL-S – which has won 18 straight games – hosts West Jefferson tonight. https://www.urbanacitizen.com/wp-content/uploads/sites/36/2019/02/web1_GabbyHollar020619_ne201926211121790.jpgWest Liberty-Salem’s Gabby Hollar (4) drives the lane while Mechanicsburg’s Grace Forrest (11) moves to cut her off on Wednesday.